The Pinwheel Galaxy (also known as Messier 101, M101 or NGC 5457) is a face-on spiral galaxy located 21 million light-years away in the constellation Ursa Major. First discovered by Pierre Méchain on March 27, 1781, Charles Messsier verified its position for inclusion in the Messier Catalogue as one of its final entries. With a diameter of 170,000 light-years it is roughly equal to the size of the Milky Way. It has a disk mass on the order of 100 billion solar masses, along with a small central bulge of about 3 billion solar masses. 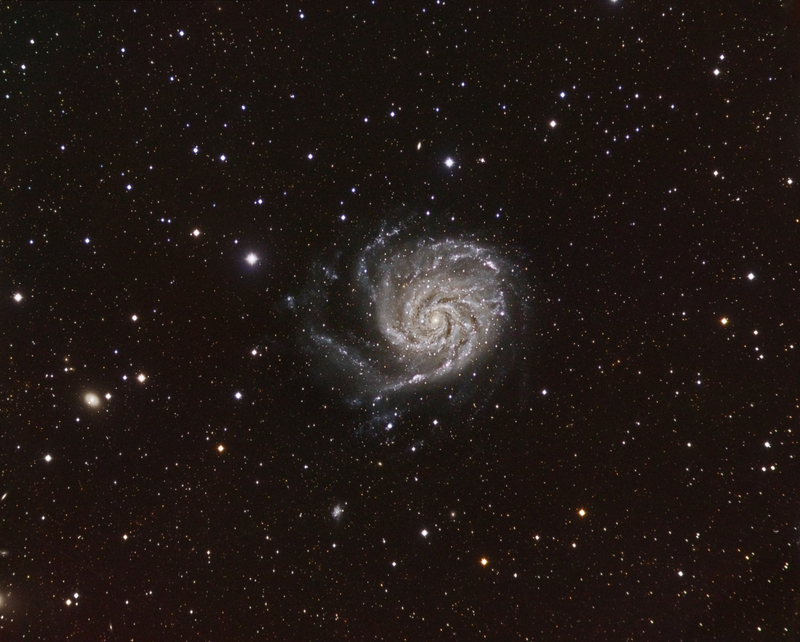 M101 is noted for its high population of H II regions, many of which are very large and bright. H II regions usually accompany the enormous clouds of high density molecular hydrogen gas contracting under their own gravitational force where stars form. H II regions are ionized by large numbers of extremely bright and hot young stars; those in M101 are capable of creating hot superbubbles. In a 1990 study, 1264 H II regions were cataloged in the galaxy. Three are prominent enough to receive New General Catalogue numbers - NGC 5461, NGC 5462, and NGC 5471. M101 is asymmetrical due to the tidal forces from interactions with its companion galaxies. These gravitational interactions compress interstellar hydrogen gas, which then triggers strong star formation activity in M101's spiral arms that can be detected in ultraviolet images.